GeoGrout’s pressure grouting procedures and site specific mixes have been utilized for void filling applications, such as: abandoned underground pipes, concrete slab construction joints, structural steel pipe columns and heavy equipment base frames. Pressure grouting annular spaces of slip liners poses additional challenges, due to the minimal available void space between the liner and host pipe. GeoGrout has produced grout mixes to fill annular spaces of less than 20mm, over spans of 100m. Grout pressures to place these mixes are maintained within pipe manufacturers tolerance. n concrete slab-on-grade construction, as the concrete cures, differential hydration between the upper and lower surface may occur. 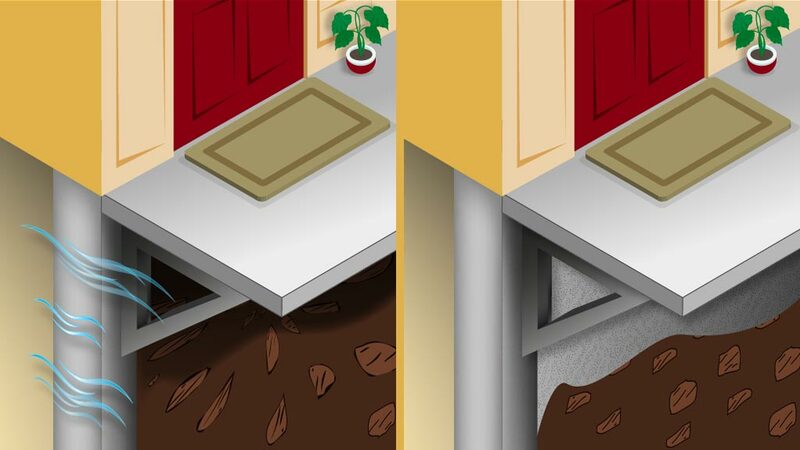 This will cause the concrete slab to curl upward, primarily along both sides of the construction joint, leaving a minor void space along the alignment of the construction joint. This problem becomes quite serious in laneways subject to heavy traffic. The continuous pounding effect at the joint interface, tends to increase the void size resulting in continual flexure of the slab and subsequent failure. Water intrusion will also expediate this process. GeoGrout has resolved this problem by injecting a high flow fine particle structural grout beneath the construction joint interface. The grout fills all available voids and restores the bearing surface of the subgrade. This process eliminates any further flexing of the slab, by locking the joint interface, and substantially increases the life span of the concrete slab. To accommodate design specification requirements on building projects, GeoGrout has produced flowable structural grouts with compressive strengths up to 80 MPa. These grouts have been implemented on a variety of projects such as grouting of heavy equipment bases and steel pipe columns to enhance their load bearing capacity. GeoGrout has utilized cellular grouts in dry environment applications requiring R Value enhancement. This light weight product can be produced with up to 80% air content, giving it it’s insulating value provided it is placed in a water free environment. Typical applications where GeoGrout has used cellular grout include void fill of confined areas along foundation walls, trench fills over shallow frost susceptible utilities and as an infill in concrete block walls. Migration of groundwater and hazardous fluids into the pipe enclosure. Potential for build up of explosive gases in the pipe enclosure. Eventual collapse of the pipe and subsequent settlement of the overlaying structures. Excavation and removal of abandoned underground pipes can be cost prohibitive. 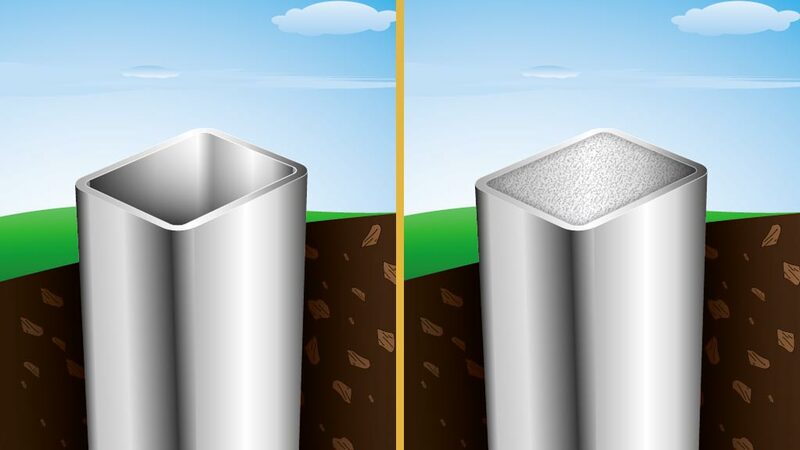 Alternatively, GeoGrout has filled insitu pipe enclosures with grout mixes that displace the existing fluids and fill all available voids in the process. As a result of edge curl at construction joints in concrete floor slabs, minor void spaces will occur along the joint interface. With continued wheel loading, the slab will begin to pump at these joints. This pumping action will create a larger void space and eventual slab distress. GeoGrout has addressed this problem by pressure grouting the void beneath the joint. 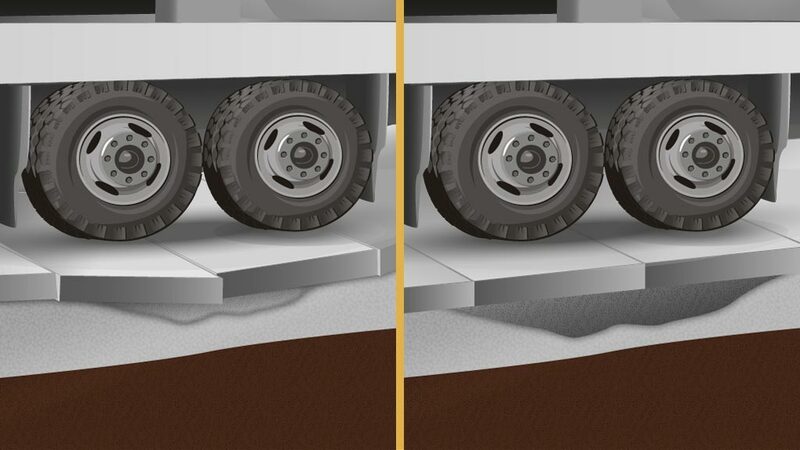 This process restores the bearing surface of the subgrade and locks the construction joint together. By addressing this problem at an early stage, the potential for slab failure is significantly reduced. High strength structural grouts used for fill of structural steel pipe columns and base frames for heavy equipment installations are typically supplied as a bagged product and hand mixed on site. GeoGrout can produce mix and place larger batch quantities in the field ensuring uniformity in the grout mix. This can prove to be economical on projects which require larger volumes of these structural grouts. Does the pipe structure have to be free of water before you grout fill the pipe? No, our cementitious grout mixes are designed to displace any water or fluids from the pipe enclosures. Will the slab lift as the void beneath the joint is filled? Through instrumentation and a string line survey system, we strictly monitor the slab to ensure that there is no adverse movement. Our concrete slab has in-slab-heating pipes. Can these pipes be located so they are not damaged during the coring process? Yes, we locate the in-slab-heating lines with an infrared thermometer prior to the coring process. What strength of structural grout can you supply? We have designed, produced and pumped structural cementitious grouts with compressive strengths upwards of 60 MPa.